For over 21 years, our motto holds true - "Childs Way, Where Every Child is Loved." Our doors are always open. 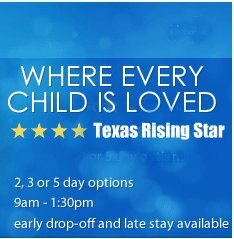 Child's Way holds a 4-Star Rating from Texas Rising Star, the highest score awarded by this accreditation standard. Normal school hours are from 9 a.m. - 2 p.m. Early hour begins at 8 a.m.; Stay & Play is from 2:00- 3:00 p.m.; and After School Care is 3:00 - 6:00p.m, hours outside of normal schedule are available for an additional cost.